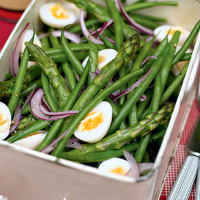 While British asparagus is in the shops, combine it with crunchy green beans and hard-boiled eggs. You can buy quail’s eggs already cooked and peeled, but if you want to boil your own hen’s eggs that’s fine too. Bring a large pan of salted water to the boil; add the green beans and bring back to the boil. Add the asparagus and cook for a further 3½ minutes, or until just tender. Drain the vegetables and plunge them into a large bowl of iced water to ensure they retain their colour and texture. To assemble the salad, drain the beans and asparagus and put them in a large mixing bowl. Add the sliced red onion, olive oil and lemon juice, season well and toss to combine. Transfer to a large lunch box or salad bowl. Scatter with the quail’s or hen’s eggs. Cover and refrigerate until needed.